You're reviewing: Microsoft Office 2010 Home and Business Product Keycard License. 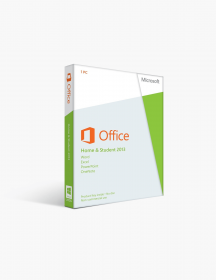 Microsoft Office 2010 Home and Business Product Keycard License. Microsoft Office platform is an already established and well-known productivity suite,that combines all essential office applications. This version of the software introduces tons of improvements as well as new features, that are guaranteed to help you work and manage your business more efficiently. Home and Business Product Keycard License gives a single lifetime access to Word 2010, PowerPoint 2010, Outlook 2010, Excel 2010 and OneNote 2010. This by its own is a solid core of applications designed to assist you in finishing business projects, tracking home and office budgets or simply doing your everyday work. PowerPoint 2010 is the leading app that allows you to create breath-taking presentations to express your ideas and thoughts. There are countless number of animation and design options you can choose from as well as already created templates, that turn each presentation into a gem. Outlook 2010 is the already one of the best email services out on the market. Now you can synchronize your email accounts so you never miss an important mail. The many build-in tools like Task list and Search tools help for easier navigation through your mailbox. Word 2010 is the perfect solution for creating documents and editing them with eye-catching lively text effects and images. Add a better visual appeal to your document choosing from a variety of templates, 3-D effects, SmartArt graphics as well as other text formatting options. The ideal tool to track down all important information about your business and household financial needs is without doubt Excel 2010. This cutting-edge world-known application help you create data-charts and tables and provides tons of features that help you process this data more efficiently. Last but not least is the OneNote 2010. This neat tool is the perfect way to store all your valuable resources at a single place. Edit any of the documents created by the other four applications above and share them with your colleagues with ease. 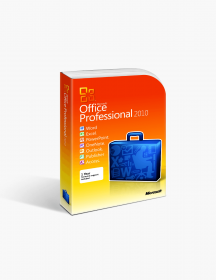 Microsoft Office 2010 Home and Business is the preferred choice of productivity software by most of the small and medium businesses out there. The above-mentioned apps have quite a few features that are specifically created to assist you in managing your startup, keeping track of spreadsheets and documents as well as staying in touch with your colleagues. With the Product Keycard License you can activate your Office without any waiting or installations. Note that however you need to have your PC with preloaded version of Office 2010 for the Product Keycard License to work. Every new version of the Microsoft Office is better than the previous and 2010 Home and Business is no different. It inherits all the previous well established features, while also improving many of them. The main areas are improvement are in better laid out interface and cross-application functionality that will help you work in a more efficient manner. Enhanced Ribbon interface – This well-known unique feature is what makes Office suites so powerful. It is a smart, effective and easily-customizable interface field, that displays all the available and recommended tools for the document you are editing. Options that are usable only when, for example an image is selected, come up in contextual tabs that can as well be modified by the user. Backstage section – This is the full-page document management section that has all the open, save, export and print options. It also features more complex tools such as adding watermarks, password encryption or adjusting file permissions. Backstage is the perfect way to guarantee the quality of your documents. Effect Preview – Making effective changes to files was a thing of the past. With the new preview feature you can see animations and formatting options while simply hovering with mouse over them, without the need of committing. It is integrated among all Office applications therefore allowing you to save time and not worry about consequence after applying a certain effect. Mobile responsive – It comes to no surprise, that with Microsoft Office 2010 Home and Business, you are given access to all your favourite apps fully-customized for mobile and web platforms. Manage your business and personal needs without the need of being stuck on your computer. This is the go-to office suite for home, business and even educational purposes, that gives you all the necessary tools to help you streamline your workflow. 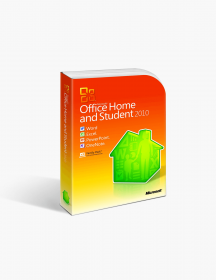 Because Home and Business version extends Home and Student one, this package also provides everything required for students and graduates to finish their academic projects and presentations. The ability to instantly activate your Product Keycard License might seem irrelevant but considering your PC have a preloaded Office, this is for sure the best way to go. Saving you time from installation processes and discs management is just the first step in increasing your productivity. Office 2010 Home and Business is the perfect solution for everyone, regardless of their work dynamic. No matter if you prefer to work from home or you travel a lot, the mobile apps as well as the lightning-fast desktop applications make sure you can open, share and edit your files wherever you are. These are minimum system requirements for installing Microsoft Office 2010 Home and Business Product Keycard License.